If you have any Asian style santoku knives in the kitchen, you will know the importance of keeping them sharp and using the proper tools to do so. Purists will always maintain, that if you have expensive Asian knives, you should really be using a whetstone to keep those edges in tip top shape. However, getting to grips with a whetstone just isn’t practical for everyone. Even if you are able to use a stone sharpener on your knives, you may not always have the time to do so. In steps the Wusthof Asian Edge Knife Sharpener. 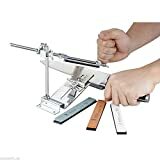 For fast convenient sharpening of quality Asian knives, this manual pull through sharpener hopes to be your go-to sharpener. So what makes this any different from other two stage manual sharpeners on the market? Well it is designed specifically for your Asian knives for one. The slots are angled at 17 degrees to ensure the edge is sharpened correctly. The tool utilizes coarse carbide heads in one slot; there to reset the edge on any of your dull blades. The other slot uses ceramic rods for essential fine-tuning. Very simple to use, the Whustof Asian Edge sharpener can be operated by anyone. The two slots are clearly labeled, (making it absolutely fool proof), and you simply pull the knife through a few times to refine or restore. 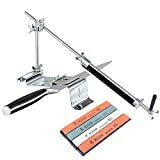 To help you hold the sharpener in place while in use, it contains a large flange-style handle with a rubberized grip, (useful if your hands are kitchen moist). Suction cups also keep the tool from sliding about your worktop. Wusthof state in the manufactures spiel that a well cared for santoku knife requires no more than a couple of swipes through the ceramic slot in order to keep your blade in razor-sharp condition. 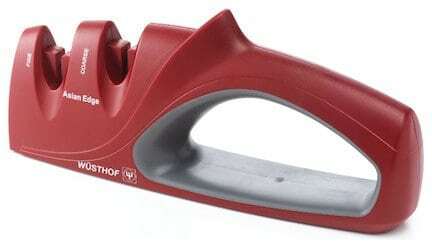 Wusthof is a popular brand in the knife sharpening arena, and have produced a number of bestselling products. True to form, this particular Asian style pull through sharpener has garnered many positive reviews online. A whetstone will generally provide better results if you know how to use one. Overall, a high performing manual sharpener that really excels on convenience. While not as good as a whetstone when sharpening your Asian knives, for pure ease of use and time saving ability, the Wusthof Asian Edge sharpener is pretty hard to beat. Chef’s choice has released a similar two stage Asian sharpener, (you can check that out here). However, with the Wusthof retailing at a lower price and being equally as good from a performance perspective, it could very well be the one you go for.